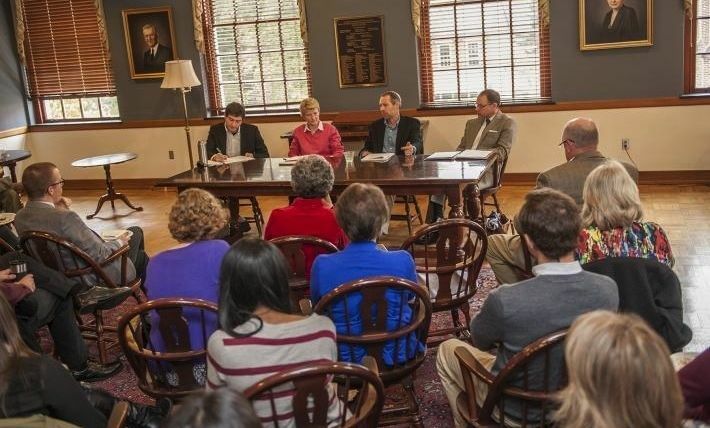 In the wake of a mid-term election that saw Republicans wrest away from Democrats control of both houses of Congress, a panel of Franklin & Marshall College faculty offered insights Nov. 10 into what may happen during the next two years. The most obvious result of the election was that voters chose a divided government instead of keeping Democrats in control of the Senate and changing the majority in the House, the panel of four government faculty said. "This means the voters voted for the gridlock the claim to despise," said Professor of Stephen Medvic, who was joined on the panel by Associate Professor of Government Jennifer Kibbe, Instructor of Government Herschel Nachlis and Professor of Government Matthew Schousen. Republicans gained seven seats in the Senate, and possibly two more pending the results of upcoming runoff elections. They picked up 15 seats in the House, three governorships and 10 state legislative chambers. The GOP now holds more legislative seats than at any time since the 1920s, Medvic said. For he and his colleagues, the election's outcome was not surprising. "Most political scientists predicted it," Medvic told a large gathering of the F&M community who packed the Academy Room in Shadek-Fackenthal Library. "Since 1934, the sitting president's party has only gained seats twice in a mid-term election." Voter turnout for the election was the lowest for a mid-term since 1942, which hurt Democrats because their party controls the White House, Medvic said. People who vote in presidential election years typically don't vote in mid-term elections. Added Schousen: "This is a continuum of how much gridlock we can expect." Schousen said the federal government was not set up to be efficient. It has three different institutions -- Congress, the Judiciary and the Presidency -- with different authorities and different gate-keeping powers, all of which makes compromise necessary for the collective, but difficult for the individual politician who wants to stick to his or her principles yet fears losing re-election. While GOP leaders in both congressional chambers express interest in working with Democratic President Barack Obama, Schousen said he has his doubts. "Can the leadership rein in their members to get things done? That will be an early test," he said. Where Obama could see cooperation with Republicans is on free trade and some foreign policy issues, said Kibbe, who chairs the Government Department. She cited a recent poll that showed 58 percent of the electorate supported the president's fight against the extremist Islamic State of Iraq and Syria, or ISIS. While Republicans no doubt have the votes to repeal the Affordable Care Act, better known as Obamacare, the most they will likely do is nibble around the edges, abolishing or shifting some aspects of the program that are unpopular such as the employer mandate, Nachlis said. "It's not going to be repealed," Nachlis said. "Once policy comes into being it's almost impossible for it to go away." The issues Congress likely doesn't address over the next two years, such as paid family medical leave, gun control and criminal justice reform, will become issues for the presidential contest in 2016, Nachlis said. The Iowa Caucuses are less than 14 months away.